Back in January 2012, I wasn’t sure any home improvement projects were going to happen On Sutton Place. Not that I didn’t have a list a mile long…but my plate was full with other things. However…I had this plan. I really, really, really wanted to quit my job and attempt to earn a small income doing what I love. Blogging and sewing. So I figured I had better get one major project out of the way while I was still earning a steady paycheck. I am proud to say it turned out so much better than I expected. It is, without a doubt, my favorite project ever. If you missed it you can read about the entire process of my entry renovation here, including a handy little tip on installing a gallery wall. As most of you know, I did quit that job and have been self-employed (that sounds so legit) since June. Suffice it to say that the next project had no budget at all. 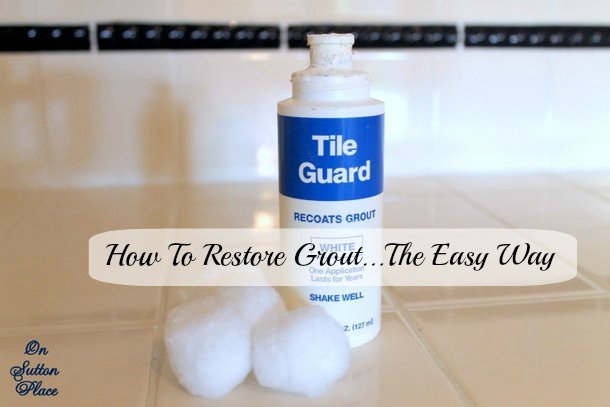 I had a dicey grout situation and needed a very quick and cheap fix. I found it with this product called Tile Guard. It was so easy. I applied the coating back in August. It still looks great and is wearing well. Although it’s not a permanent fix, for now at least, my tile is clean. Our final project of 2012 was painting our gigantic deck. Our deck finish was virtually non-existent and bare wood was showing through. I’m all for rolling up my sleeves and attempting DIY projects when possible…however, this project we left to the pros. I loved the gray stain when it went on…but it definitely shows the dirt much more than the natural stain. The leaves and other debris from the trees made a mess of things. It will be interesting to see what it looks like when I clean it up in the spring. I’ll let you know. There you have it. I’ll be back tomorrow with my most pinned post. Can you guess what it is? Great projects to me that shows a successful year on the project front. Cheers to 2013! Three great DIY projects! :D I hope to get some projects accomplished this year. *hope* being the operative word….. I have been wanting to do the same thing to our deck ever since. Actually we just discussed making the change in the spring but the number of trees has me a bit nervous. I absolutely love the look of your transformation though. Love you new stairway color, like you I have “lightened” up a bit. Love the color also! 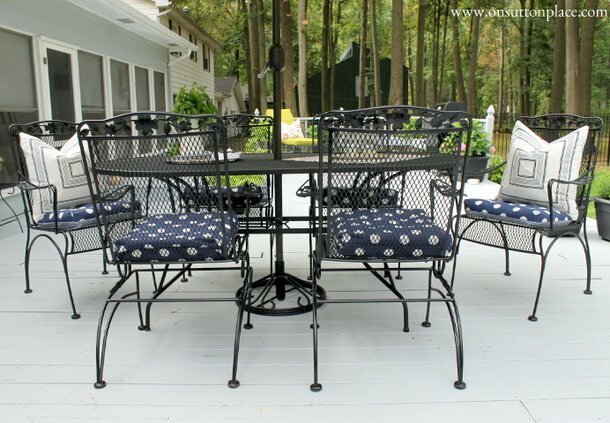 The deck looks so inviting, and would spend a lot of time out there. Ann, you have accomplished so much this year! 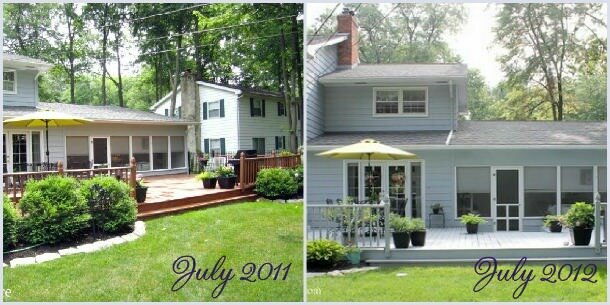 I remember when you shared the newly painted deck, and shortly after, a major storm blew through your town! Everything looks so new and fresh in your beautiful home. Happy New Year! 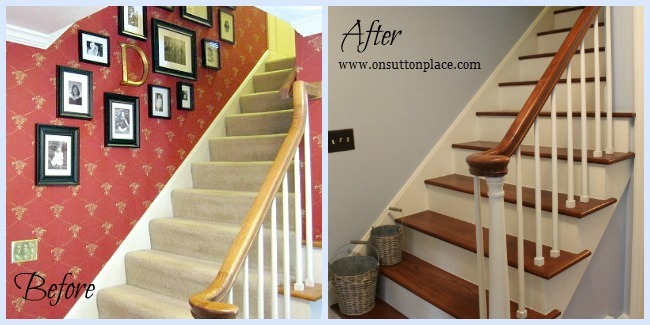 Beautiful updates, Ann, I love your staircase, it’s beautiful and looks professionally done. You have accomplished a lot this past year. These were big undertakings, Ann, and you did a wonderful job. I really love the stairs, what a difference! Love that staircase! 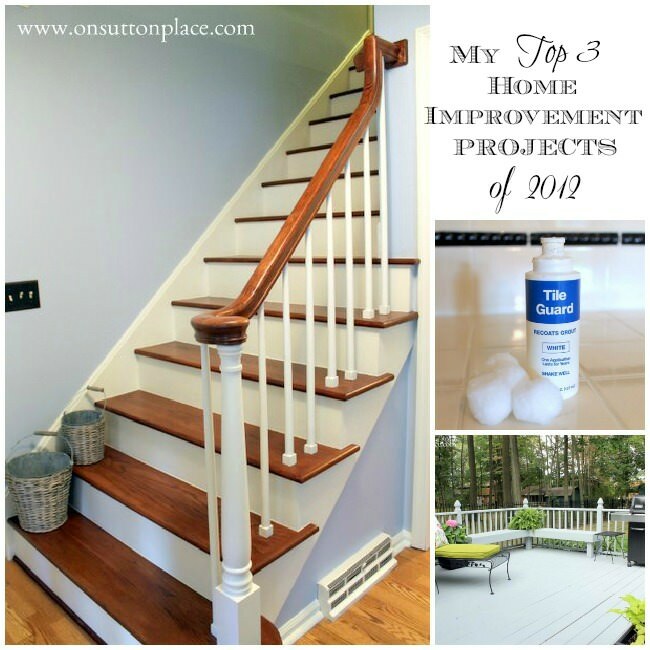 I always enjoy reading your blog and can’t’ wait to see more in 2013! It all looks so fabulous! You must be so pleased with the results. Here’s to a successful 2013! Love the porch project, it looks great. You had a busy 2012. Also love the wood steps versus carpet, I guess I love the natural wood look better! Have a great weekend. You did some wonderful projects this past year! Happy New Year Ann! Happy New Year, dear friend!!! I am going to tackle my stairs this year!!! I’ll be using your post as inspiration… and how-to! It looks like a brand new deck, Ann! I remember you saying you would be out there a lot in the warmer months. Your foyer/entry was a great makeover, too!